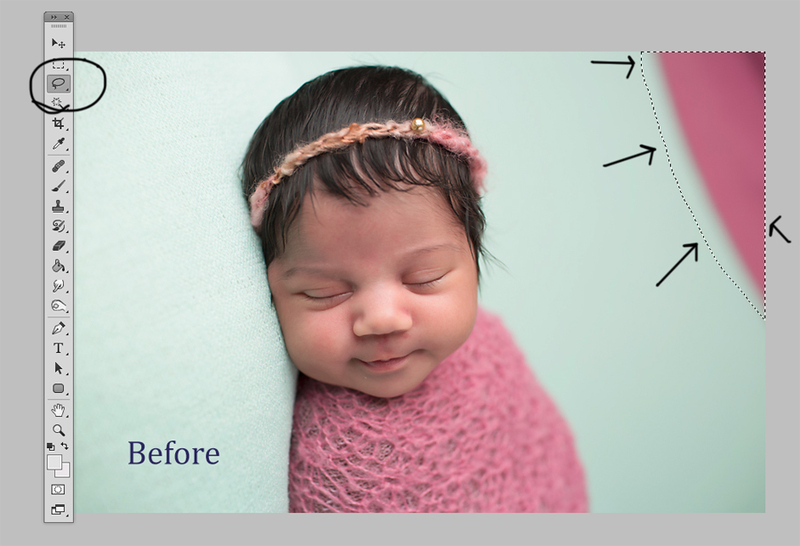 So, I thought I’d share how to use an awesome little tool in Photoshop called “content aware”. I personally love it and use it for a wide range of touch ups for almost every session. It can save you a lot of time and is very easy to use. In a nutshell, you pick an area of the picture and content aware fills it in with missing content and/or covers up unseemly items that do not belong in the shot (such as a spotter’s hand or foot, baby’s pacifier, etc). 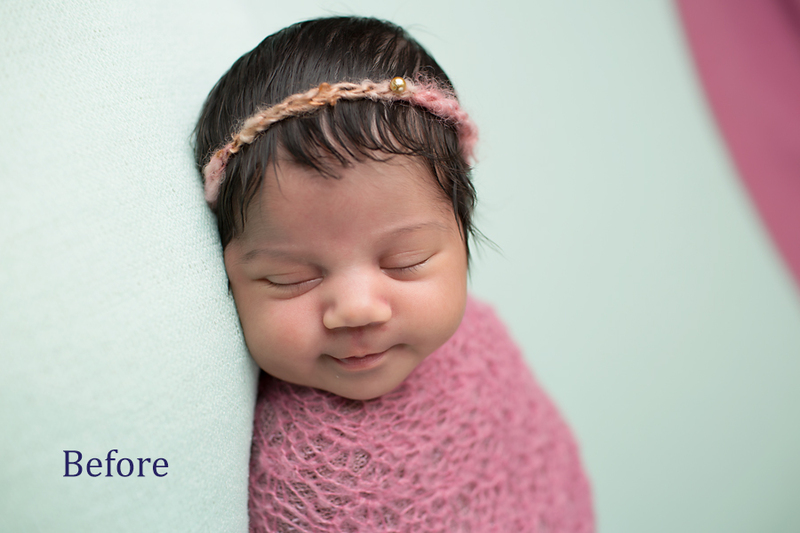 Here is an image from a recent newborn session. 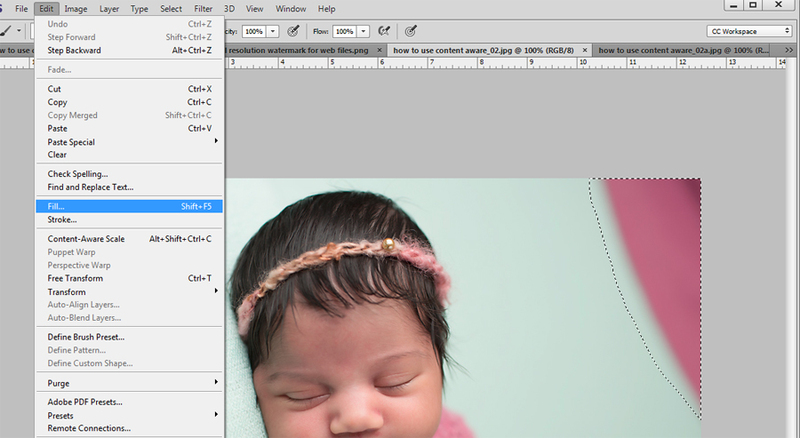 As you can see another background blanket is showing in the corner of the picture. So, I use content-aware. 2. Then I pull up the “content aware” tool. You can go to edit->fill or press Shift+f5 (I usually remember shortcuts of all the common commands I use, so I do the latter). 3. In the “fill” menu that opens up I use the “content aware” option, turn on “color adaptation” and use “normal” blending mode at 100% opacity. 4. All done. Takes about 10 seconds. Due to the “color adaptation” option, content aware works great as a way to extend seamless paper backgrounds that may have a bit of light/shading going on. As an added bonus, since “content aware” fills in parts of the picture using existing content, (unlike the method where you paint in the extension ) it does not create any extra banding when extending the seamless (if there is already banding in the picture, of course, it will show). Here is a before and after. I wanted to extend this picture’s width, so first I extended the “canvas” (the white areas are where I want to fill in), and then used a marquee tool to select the empty areas and fill them in using content aware. The applications of the “content aware” tool are endless! It works best with solid colors or repetitive or patterned floors or backdrops/backgrounds, but you can experiment and find that it works quite well in other situations. You will also find that in some cases it does not work at all (mostly, it is due to the fact that the software can’t tell the pattern you want to extend from other things in your picture, and then includes parts of these objects into the extended ‘filler’). Again – just experiment with it, and find out how it can best work for you! So, to recap: (1) lasso tool, (2) Shift+F5 to pull up the content aware menu, hit OK and enjoy! Hope you’ll find it handy, and I”d love to see some examples and hear some feedback! How to Take Underwater Photos of your Kids in the Pool? It is almost summer, and I am sure many of us are looking forward to warm sunny days, lots of ice cream and pool fun! I know I am! I am especially excited about taking my kiddos to the pool (oh, and we are so blessed to be living in Reston, which has 15 pools)! They are almost 4 and 6, and both are very comfortable around water. The “big one” is an independent swimmer (although of course I would never let him too far out of my reach and would never take my eyes off of him), the “little one” is my little fishy and he can float around and even swim a few body lengths underwater. Both LOVE! LOVE! LOVE! doing loud splashy canon-balls and jumping off the diving board. On my end, these days I am a lot less neurotic about taking them to the pool (now that they can just “swim to mama” or “swim to the steps” on their own). Instead, I will be enjoying my splashy summer fun with them and I CAN’T WAIT to bring my camera to the pool and do some awesome underwater photography as they jump, dive and splash.Â So, I thought I’d share some pictures of our pool fun last summer along with a few tips about how I got these images. 1. Underwater housing and gear: obviously, if you are going to shoot underwater, you need to protect your camera. Most electronics stores carry waterproof cases for different iphone and ipad models, so you can just pick the one that fits your style and budget. If you have a DSLR camera, I recommend the type of underwater housing that allows the lens to be firmly attached to housing on the inside (so, not just a clear waterproof plastic case).Â This would prevent focusing and glare/reflection issues (which is a very serious consideration because focusing and glare/reflection issues can render all images you take underwater unusable). I currently useÂ Ewa-Marine underwater housing (click here to follow to their website) for my 7D+17-40 mm f4 Canon L lens, and I highly recommend it (all the images in the post are shot with the camera+lens+camera housing combination)! It is a respectable underwater housing brand, and I have always felt very comfortable with it! US photographers can purchase their housing via adorama or bhphoto. You would need to think about what kind of photography you do and what lenses you own because you will have to specify lens thread (for example, 72mm, or 77mm) when purchasing the housing because your lens will screw into the clear glass plate protecting the front of your lens while underwater (Ewa Marine housing offers step up rings if you want to use different lenses, but I’d suggest buying the housing to fit the main lens you are planning to use) The Ewa Marine housing secures the lens firmly, and has a special grip to hold the camera, a strap to hang it around your neck/arm while you swim, and a special pocket for your right hand index finger to give you comfortable access to main manual control dials (it does require some practice to get used to). I had many questions when I was researching the right housing to buy, so I just called the brand distributor in the US (info here), and they were happy to help. Now, I mentioned that I use my 7D camera for underwater photography, and I feel very comfortable using the Ewa Marine housing with it. If I were to engage in more serious, higher-end underwater photography, I’d probably want to use my canon 5d mark iii for best image quality and I’d want underwater housing with faster access to all manual controls – a higher end, pro underwater camera housing (so far, from my own personal research, I can say that I’d confidently invest in an “ikelite” model). – It allows you to get closer to the subject, which is important for two reasons. First, it is a crucial consideration if you are photographing children who are not yet excellent swimmers and you want to be at arms’ reach! Second, the shorter the distance between the camera and the subject the less water there is separating the camera from the subject, therefore your images will be clearer, brighter and less murky (so, you can keep your iso lower and your shutter speed faster). Water changes qualities of light and color and the farther away your subject is, the more distorted the color will appear (for example, reds will be lost and there will be greater shades of blues and grays) and the ‘muddier’ your photos will look overall. 3. Aperture:Â using a small aperture between f8 and f16 gives you a greater focal plane, and makes it easier to keep your diving and moving subject in focus (my go-to number would be f11, if I had to open aperture up to add more light and I couldn’t slow down the shutter or boost iso any more, I’d go down to f8). The “aperture” factor is closely related to the choice of a wide angle lens as they complement each other to allow the photographer a greater depth of field and keeps more of your subject in focus while photographing at closer range (small aperture is also more forgiving if you miss your focus a bit). Aperture is the FIRST dial I set when preparing to shoot underwater. 4.Shutter settings: Use at least 1/160 shutter speed to avoid motion blur in your images, if you have to, you can go to 1/125 but then you would need to make sure that your focusing is spot on and you may still get a little bit of motion (especially in hands/legs). It is the second setting I adjust for underwater photography. 5. Iso settings: I set my ISO afterÂ setting aperture and shutter (basically, I set it to whatever iso is required to get the correct exposure). This said, I recommend knowing your camera’s iso limits or, in other words, how high you can push your iso before image quality degrades considerably due to noise. With my 7d, for example, I wouldn’t push it higher than 800 (and I’d use iso800 underwater only if I absolutely have to); with my 5d mark III I’d probably go comfortably up to 1600 (but I do not think I’d ever need to go that high). 5. Burst mode: Photograph in burst mode! If you are using an iphone or an ipad, just keep the shutter button pressed to take a burst of pictures. For DSLRs, you would need to set your camera to burst mode manually (I recommend setting to the fastest burst speed your camera is capable of). Remember, you are dealing with multiple factors when photographing underwater: a moving subject, swimming and holding your breath while photographing, waves and bubbles, and, finally, looking through the viewfinder underwater to focus on your moving subject (OMG, can I just say this was the most difficult thing for me to master, I hate opening my eyesÂ under water and there is really no way around it I want to see through the viewfinder to focus. Alternatively, you can use live view on the back screen of your camera, but I found that it takes longer to focus and resulted in too many missed shots). Please keep in mind that if you shoot in RAW your camera’s and your card’s recording capacity will dictate the speed of the burst mode and how many shots you can take per single burst. If you feel like you would want or take many images in a sequence to get what you want, I’d go with JPEG only. If you think 3-4 is enough, then RAW or RAW+JPEG would work. 6 How and where to photograph: Start out by photographing on a sunny day in a shallow end of the pool. If you have a choice, I’d suggest choosing a pool with white or light blue walls and bottom so you get more light reflected back on your subject. The darker the pool’s walls and bottom, the greater the color cast and the more light your camera’s sensor would need for adequate exposure. Get up close to your subject, and start by focusing on portraits – kids’ expressions are priceless when they pose underwater! And then – practice, practice, and practice some more. And don’t forget to have FUN! Oh, and finally, if you are in Northern VA and you want me to come over to your pool to photograph your kids – shoot me an email at chasingmoments@gmail.com and we’ll work something out! I am starting to consider summer-time underwater sessions for clients with access to their own private pools or where they have community permit to conduct photo sessions, so I”ll be happy to work with you on making a “pool fun” session happen for you.